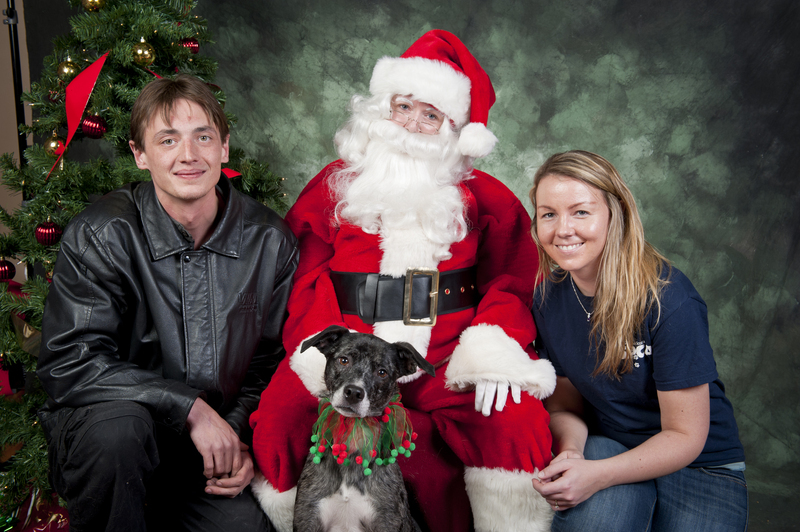 I didn’t meet my goal of bringing The Cat to Santa Pix this year. It seems wrong to have our annual holiday picture without a member of our family. Somehow, I don’t think he minds. As nice as it would be to have him there with us, I don’t know if it is worth the sacrifice of his discomfort. Or Santa’s, for that matter. The Cat can consider it my personal gift to him. I hope you all have a wonderful time with your family today, wherever you are and whether you celebrate the official holiday or not. I am so grateful to have you in my life and consider each and every one of you a friend. Thank you a million times over for every kind thought you’ve shared my way. I don’t want to get too maudlin on a day of joy but you have made a big difference in our little world. Merry Christmas! What a great photo! Smashing photo. Definitely one for a frame. Hope you are having a lovely Christmas Day. LOVE the photo!!! Merry Merry Christmas! Don’t feel bad, back in October my husband and I had a photo shoot with Dakota…almost brought Cody but decided against it just like you! Thanks Kristine. May you and your family have a wonderful day with your families. What a cute picture although Santa looks very young. Is that the real one? Merry Christmas from all of us. That’s such a cute Santa picture! I do think that the Cat probably appreciates not being involved. Happy Holidays to all of you, kitty included! Hey Kristine…we don’t celebrate Christmas…but I understand the festive cheer n season of giving, loving and care. We hope that you, PH, Shiva and Kitie Meister (pardon the spelling) have a beautiful holiday. Merry Christmas. Merry Christmas, Kristine, and to Bad Kitty and Shiva and the PH as well! May it be a year of blessings, new experiences, and successful agility trials! What a great photo of you all!! Merry Christmas Kristine!! Merry Christmas! Love Shiva’s fancy fancy party collar. I love the photo. I hope everyone had a great Christmas. Best Wishes for a happy, healthy, and prosperous New Year. Cute picture! I like the way Shiva and Santa have the same tilt to their heads. Hope you had a lovely Christmas and that the cat did NOT get thumbs. That would be scary indeed! That’s a great photo with Santa!!! My girl looked kinda startled in her photo this year. Aww, look at you all! What a wonderful picture and Shiva is perfect!